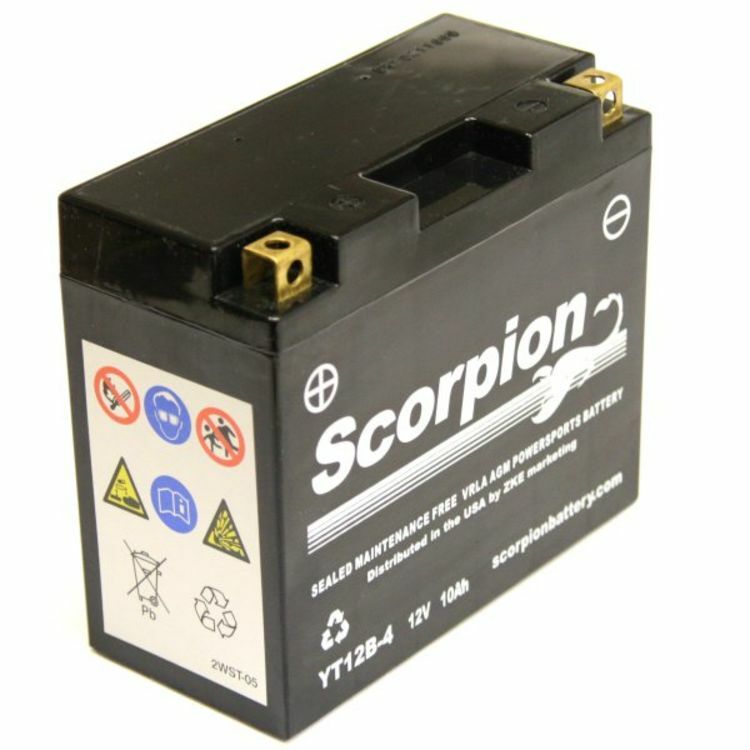 Scorpion Battery is one of the largest seller of aftermarket batteries in the USA. 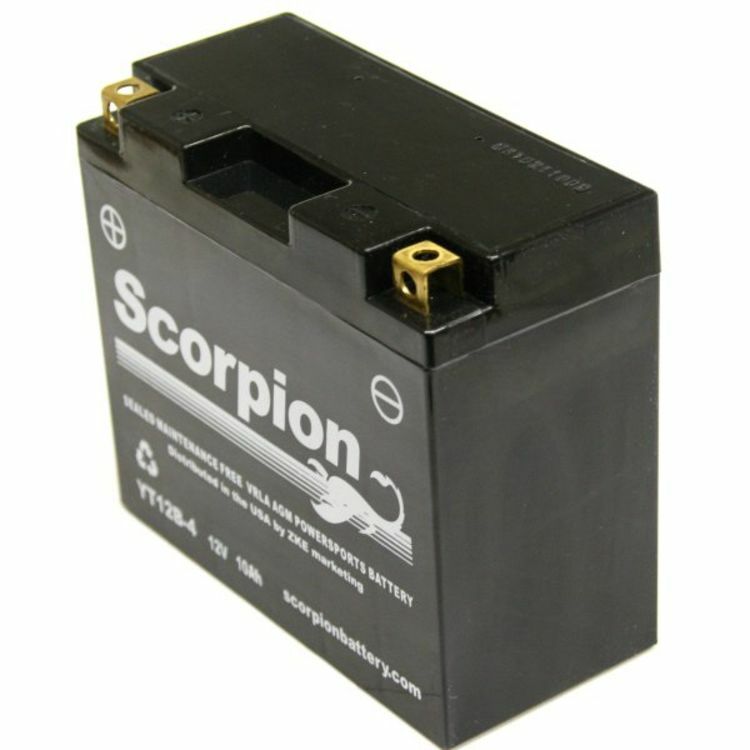 Scorpion batteries are made to last and to perform even better your OEM Battery. You will be impressed! All Scorpion batteries meet or exceed the specs called for by your motorcycle manufacturer! Rated 4.65/5 Stars from 17 customer reviews. Do you own the sYT12B-4? Please, tell us what you think about it. It helps us provide you with better products. Please note that it may take up to 72 hours for your review to appear. Pros: Great site...found battery in minutes to order. Great price and shipping. Confirmation to email. Timely delivery. Battery worked on arrival. Pros: The product was as advertised. Very quick delivery. Will use for all my battery needds. Pros: I have always had good luck with any and all products that I have ordered from battereyStuff and the service has always been very very good. It's always satisfying when I deal with batterystuff. Pros: Put the battery on my VStar 650, started right up. Fit like the original battery, can't wait for the weather to warm up so can go riding. Pros: What more is to say that you guys are the greatest with getting back with info as well as customer service is top of the heap. Delivery time excellent,helpful and no run arounds when called. Great to do business with second batter as well as tender bought all excellent! Pros: I have replaced all my old bikes batteries with sealed batteries from Battery Stuff. No probles and very fast shipping. Pros: It fit just like the original...maybe a bit smaller I hooked it up and it worked...as advertised. What more can you ask of a battery? It's only been in service for a couple of weeks, so no long term comments yet. If it continues to perform this well I'll have to revise the rating to 5 Stars. Pros: Exact replacement fit for existing motorcycle battery. Working great so far. Only had it for 3 months so can't say anything with regards to how long it will last. Pros: The Scorpion battery appears to be made very well, and performs just as it should. No glitches. Priced very well compared to the competition. Processing the order was immediate and delivery occurred in just a few days. Who could ask for more? Pros: Scorpion makes an inexpensive but good quality battery. I found some strange behavior in the battery I received so I called Tucker at BatteryStuff. He spent a lot of time explaining the characteristics of the battery to me and outlining a simple test. When I asked to exchange the battery a few day later they got it done right away and sent a battery they had charged and tested before shipping. THANKS! 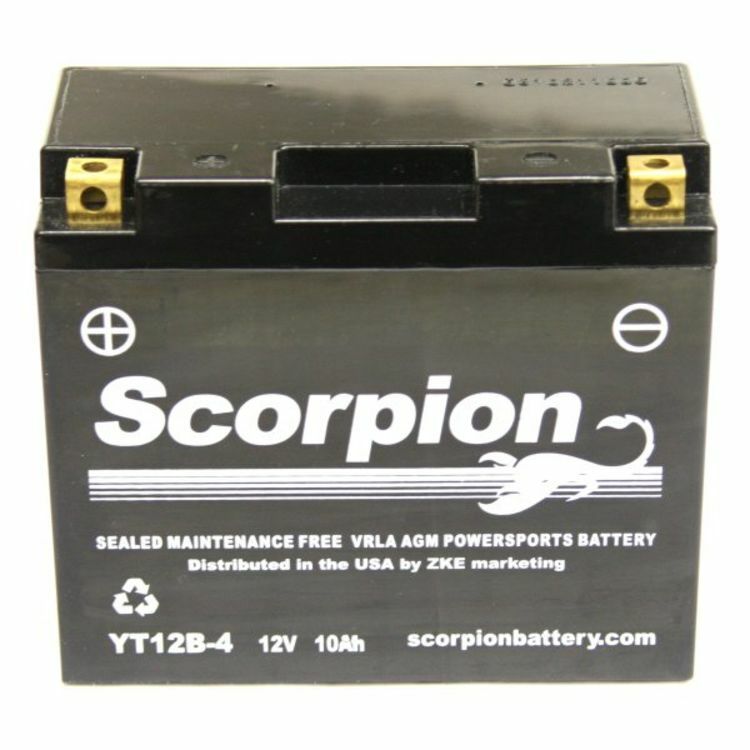 I assume this will perform and last as well as the other 4 or 5 Scorpion batteries I\\\\\\\\\\\\\\\'ve had over the years, which is quite good at any price. Cons: None. Good batteries, great service. Now and then you get one off spec. BatteryStuff did a great job in making it right. Pros: They replaced the battery with minimal inconvenience. Cons: This was a replacement for one that started to die after just a few months. I had to keep the battery on a smart tender to ride. It got so bad the battery wouldn't start my bike sitting for a lunch. They required a specific set of tests before sending me a warranty replacement. While a hassle I do understand that they wanted to ensure the battery was the problem. I hope the replacement lasts longer than the first one. Pros: Scorpion batt. is looking good so far. I've had it about a month now and it is working very well. It replaced the original batt. in my 2010 Bonneville. I like the fact that this batt. is supplied ready to use, no need to add messy dangerous acid. If you buy the brand name original equipment battery you have to add a bottle of acid to activate the battery. I have done this before and I consider it a messy and potentially dangerous thing to perform. Kudos to Scorpion and BatteryStuff.com for supplying a product that is ready to go! It remains to be seen how long the life of the Scorpion battery will be. At this point in time I am satisfied with my purchase. Pros: Low cost for an AGM battery of this quality. added beneift of free, on time shipping. Excellent cost to value ratio For a high CCA battery.